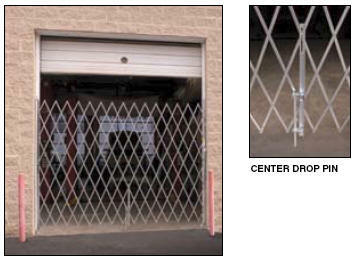 6' - 7' Single Galvanized Folding Gates. Secure outside access during the day and add security at night with heavy-duty 15 gauge steel folding gates. Durable 3" rubber casters allow operator to quickly and fully retract gate when not in use. Center drop pin rests in pre-drilled hole to secure gate when extended. Easy installation! Lock is located on right side on single gates. Galvanized for durability. Constructed of steel U-channels riveted back to back using aircraft quality rivets and heavy-duty 1½" x 1½" vertical angles. Installation hardware included. See table for specs.